This is a long piece but bare with me. You will realise how quickly having the most amazing time. Then lead, to needing to cut short my epic cycle trip around Europe. As I pedalled up and around a bend, nearing the end of a long day of cycling from Bitola, Macedonia, down into Greece. I spotted a group of buildings a short distance off the road. There was a guardrail along the roadway, so I leaned my loaded bicycle against the rail and waited for a break in the traffic. I had just passed a road construction crew that was temporarily blocking traffic. Now that I was up and around the curve, neither the detained drivers nor the construction crew could see me lingering along the roadside. Very little traffic was coming from the other direction, so I just had to wait a few minutes before jogging over to check my potential wild camping spot. The side-by-side cinder-block structures sat about forty yards off the road, along a dirt road worn into the field. Within the fencing, along with the modest, rectangular buildings, was a small apple orchard, which I thought might offer up an appetizer before dinner. I just had to hope there would be no locks. This is the inside of the building with the virus. Everything about this moment—the long day of pedalling, the overcast skies, the solitary landscape, the distance to the next town—beckoned me to stop. If I couldn’t get past the fence, then at least I could set up my tent somewhere in the field, behind the buildings and blocked from sight. The first gate I came upon was locked, so I continued towards the back and, thankfully, saw that a large section of the fence was missing and allowed me easy access. I hurried back to retrieve my bike and, after checking for traffic again, quickly pushed it into the compound. A thick cluster of knee-high weeds, intermingled with briars, protected the buildings. As I approached the back of the buildings, a pair of headlights rounded the curve. I found a small opening in the weeds, pushed the bike through, and leaned it against the outer wall. My heart was beating fast from the exertion, enhanced by the thought that my timing might have been just a tad off. It would be just my luck that the driver was the owner of this property and surely had seen me disappearing behind the buildings. Busted! No. As I held my breath, I listened as the car approached and quickly passed by. It was early November 2016, and Donald Trump had just been elected President of the United States of America. I had cycled since April, beginning in Iceland and then flying to Ireland before ferrying across to Wales. After meandering around England, stopping to attend a bicycle touring festival in Clitheroe, I eventually boarded a ferry leaving from Dover. Then, departing the vessel in Calais, France, I continued pedalling until I had cycled through fourteen more countries before I eventually pedalled across the border into Greece. 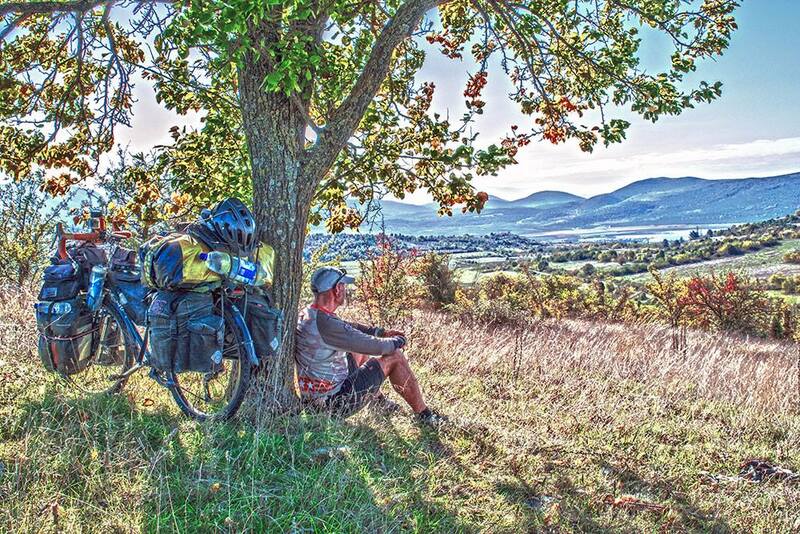 I was hoping against hope that I would be able to continue cycle touring on as many continents as possible, living the dream I had read so many other adventurers had experienced. At the least, with the recent developments back home, I was hoping to keep travelling for another four years before having to head back to the United States. Little did I know that I was about to make a decision that would change everything. The abandoned building with the collapsed wall. I had camped many times during my cycle touring adventures. The United States, with its numerous national and state parks, provided many campgrounds, albeit a bit too expensive for the long-term cycle touring budget. Some smaller communities provided lovely local parks, usually with covered pavilions, and, now and then, I could find a secluded, flat patch of trees to wild camp within. While wild camping was possible during my cycle tour in Europe, depending on how bold I felt at the moment, entering someone’s building, even though clearly not in use, was something I thought I would never do. I have read many instances of other cyclists utilizing structures to set camp up in, but most cases were the result of simply asking for permission. When I entered the easternmost countries of the EU, more and more travellers told me about their unique stealth camping experiences. Hearing their boasts about how they had used abandoned buildings often while travelling in Middle Asia and Eastern Europe, I began to open up to the idea. 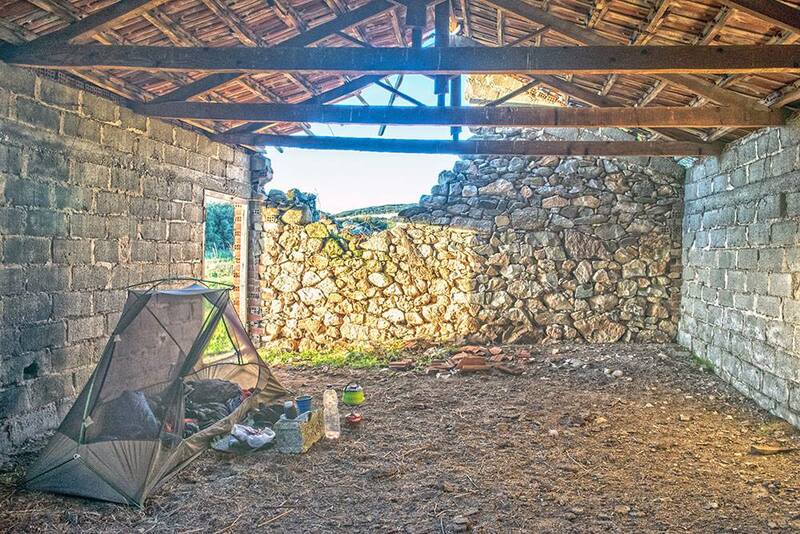 The weakened economies of these countries had led to many businesses going under and construction projects going unfinished, including some houses ending up as empty shells. One traveller had talked about spending a few weeks in such a scenario, allowing him to stop and earn money, while only needing to buy food. Still, my Americanized thinking was keeping me from entertaining this as a practical option—until today. The door to one of the buildings was held shut by a broken cinder block, which offered only a slight protest to my entry into its dark, windowless room. Only a few items were inside: leftover building materials, remnants of an old carpet, an old chair, and dust—lots of dust. As I explored, the heavy layer of dust seemed to hold everything in place. Satisfied that this was the best the compound had to offer—short of spending another night outside in the rain—I propped the door open and pushed my monster-of-a-bike inside. Its entry immediately forced the long-dormant dust particles to rise up and escape the space my bike now occupied. The shafts of light that entered the dark room from the open doorway illuminated the particles as they looked for a new place to reside. At this moment, my mind went back to a few days before I was to leave on my flight to Iceland. I was spending a few days in Seattle with my brother and his wife—she being a clinical microbiologist at the University of Washington Harborview Medical Center. When I mentioned my plan to cycle tour across Europe, and hopefully continue into Asia one day, she warned me about the potential dangers of airborne viruses, especially if I planned to cycle and wild camp in third-world countries. Watching the dust particles rapidly increase in number, now illuminated in the additional light shafts created from my flashlight, my thoughts challenged the warning signals going off in my head. But the rain is beginning to fall outside! But my constant, repetitive, long cycling days have conditioned my body to handle anything. And, but I’m rarely sick, so my immune system is probably strong enough to handle any inhaled invaders. Still, I pushed even more dust particles into the air as I cleaned a rectangular shape on the cement floor, where I would lay my air mattress and sleeping bag. As a precaution, I decided to pull my Buff headwear down over my mouth and nose. This was my compromise, at least until my bedding was laid out and my dinner was cooked and ready to eat. Later that night, I pulled the Buff back over my mouth and nose before settling into my sleeping bag—but not before propping the door open, hoping to invite a little fresh air in. My wild camp inside the abandoned building. Here you can see the missing collapsed wall better. 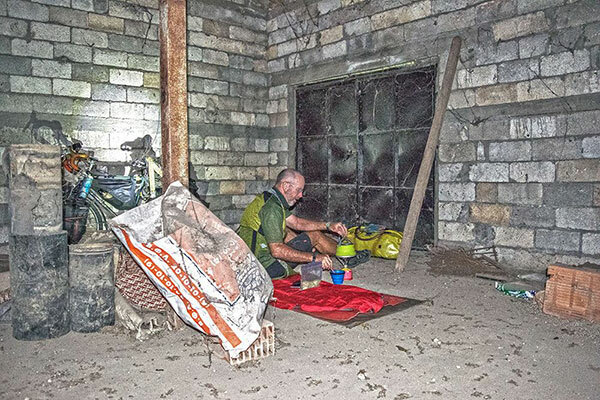 Despite waking up the next morning with the Buff down around my neck, I packed up with little concern about my first wild camp inside an abandoned building. That day’s ride went as so many others had gone before, causing me to quickly leave any concerns behind. Not until a few days later, after only once experiencing some slightly-more-than-usual laboured breathing during an all-day climb through a mountain pass, did I notice something unusual. Looking back to check traffic, I noticed a blind spot right where I might see a vehicle. I pulled over and attempted to clean my sunglasses, thinking I might have accidentally left a finger smudge while adjusting them, as I often did. Checking again, the blurry, blind spot remained. However, it was only noticeable when I looked to my left and only of concern when I heard traffic approaching from behind, which wasn’t too often during this day’s ride. So I kept going. Over the next few days, although I did decide it best to complete my journey to Athens via a passenger train, I tried to remain confident that the blind spot would only be a temporary issue. I spent two days exploring the ancient city—not wanting to miss out on a once-in-a-lifetime experience—before deciding that my eyesight wasn’t getting better and that it would be wise to fly back to the United States and seek medical attention. Checking flight options, I discovered that it would be cheaper to fly out of Italy, and, because I didn’t want to get this close to Rome and not add that memory to my cycle tour, as well, I decided to continue pedalling just a little longer. Two days of easy cycling would get me to Patras, where I would hop a ferry over to Brindisi, Italy. As I cycled up the coast to Bari, I noticed the blind spot had worsened, and I was now seeing double. I could cycle no more! I jumped on a train in Bari and then another in Taranto before arriving in Rome, where I still had a few days before my flight back to the United States. Two weeks had passed since that night in the dusty, windowless building. Resting under a tree in northern Greece. Once back in the United States, I was able to get in to see a retina specialist, who quickly diagnosed my condition as ocular histoplasmosis syndrome. The National Eye Institute website describes histoplasmosis as a disease caused when airborne spores of the fungus Histoplasma capsulatum are inhaled into the lungs, the primary infection site. This microscopic fungus, which is found throughout the world in river valleys and soil where bird or bat droppings accumulate, is released into the air when soil is disturbed by plowing fields, sweeping chicken coops, or digging holes. Although only a very small number of people infected with the histoplasmosis fungus develop OHS, if you have been exposed to histoplasmosis, you should be sensitive to any changes in your eyesight. Apparently, I had become one of that small number of people. The retina specialist prescribed intraocular injections (yes, that is a shot in the eyeball) to be administered every four weeks until it can be determined that the infection is not spreading. It’s possible that the injections can eventually be spread out over a longer period of time, but how long I’ll have to receive the shots will need to be determined later in the treatment. For now, I am learning to live with the double vision. While I won’t warn other cycle travellers to never wild camp in abandoned buildings, I would highly suggest that you do so in a well-ventilated structure and be careful not to stir up too much dust. The cycle touring lifestyle is awesome, making me as healthy as someone much younger, despite this eye issue. I’ve met so many great adventurers, seen so many great things, and created so many amazing memories. I will venture out again one day and hopefully will meet some of you along the way. But please don’t be offended if I choose not to share an abandoned building with you. I make it up as I go. My plans change frequently, but my overall goal remains the same—to experience as much of this world as I can and to live life to it’s fullest. 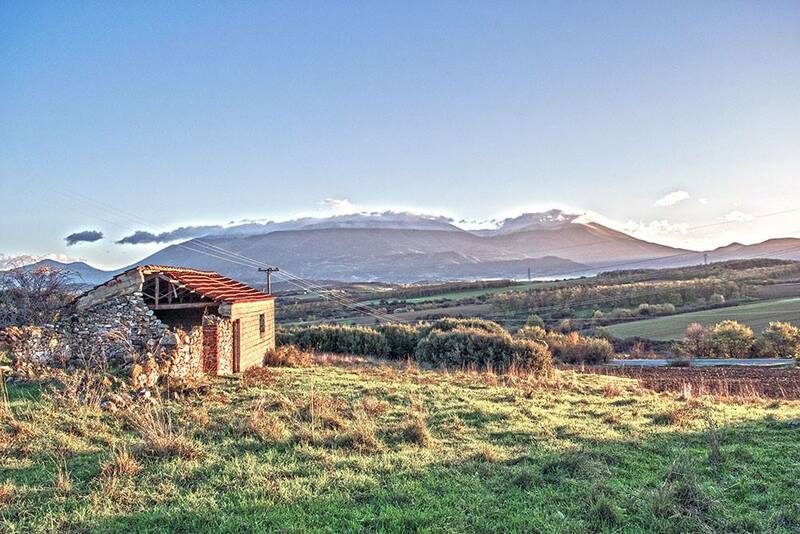 If it doesn’t have something to do with cycle touring, photography, or writing, I don’t need it. Thessaloniki, the biggest and most beautiful city in Northern Greece! Have you ever been there? Thessaloniki offers travellers a bit of sun even in winter, delicious food even in midnight, nightlife even during the weekdays and wonderful sunsets!! When in Greece, do what the Greeks do (or the Italians, Germans, Aussies etc). A little bit of advice if I may, maybe not. Here is a little story about the time my partner and I thought it would be a great idea to hire a motorcycle in Mykonos. This would be one of the many adventures we would embark upon, and one of many stories we would share over a drink or two or maybe three.